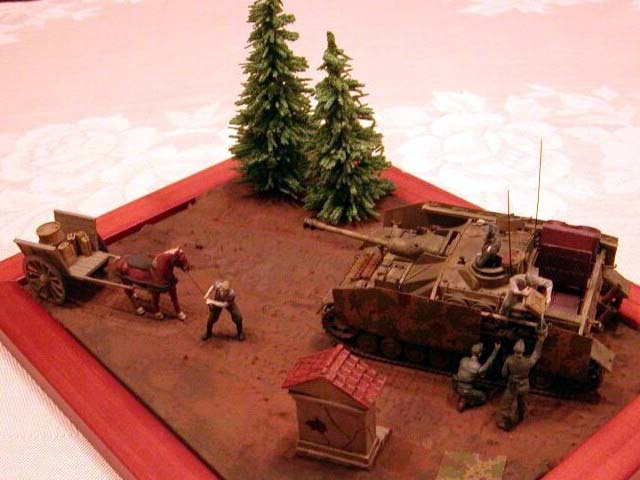 The diorama was built on a base from sololit (board made of a sawdust and glue) of a thickness 5 mm and dimensions 13 x 18 cm to fit within a wooden photoframe. 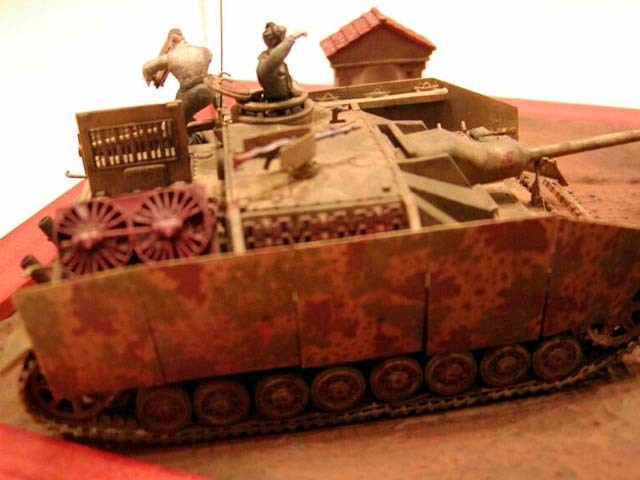 First, I made a rough shape of a terrain from a mixture of a plaster, fine sawdust, white glue (PVE) and water, once dry, I modelled the terrain by a water dilutable filler Soudal, into which I pressed marks with a vinyl track from a Pz.IV kit by ESCI. I used the same filler to seal the chapel in the terrain (I had to carve a rectangular hole for it first). Set aside for a couple of days made the terrain rock hard, I sprayed it with a Humbrol enamel Dark Earth and then I finished this diorama with MIG Productions pigments used in various methods (pigments diluted with a turpentine, water, dry application and follow-up spray of a matt varnish…). 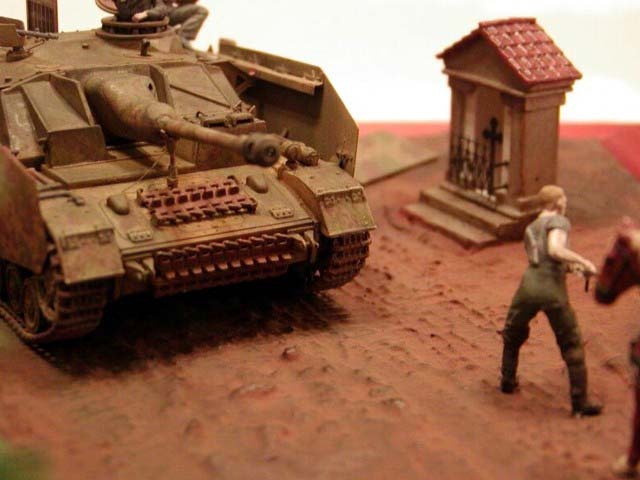 A title of this diorama is „Komm, schneller, komm…!“ („Come, faster, come…!“). 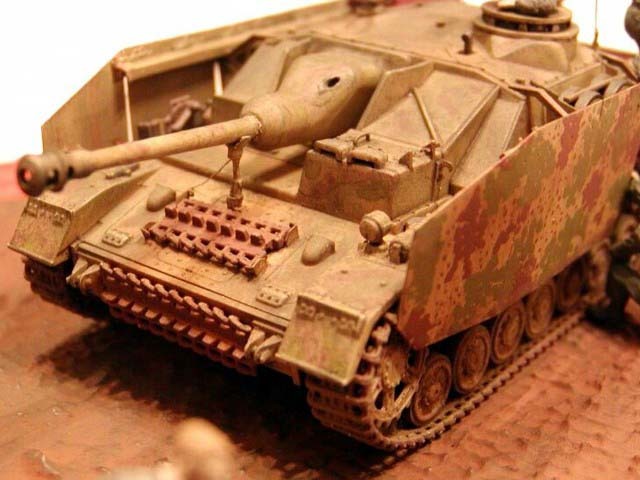 As the model offers variants in front towing brackets and because I wanted to avoid application of Zimmerit, I had to decide first, which modifications to implement and what production date my StuG IV would be. As the model has three return rollers per side, it must have been produced after mid December 1944. Other modifications and their respective dates are: vertical exhausts (08/44), termination of application of Zimmerit (09/44), barrel support (11/44), driver’s periscope brackets (11/44), driver’s hatch lock (11/44), new rear tow coupling (implemented by the field units since 12/44) and new front towing holes (12/44) – the last modification was not fully implemented by the end of the War and I did not use it either. So, my model represents a type made sometime after December 1944, serving on the Eastern front in early spring 1945. Construction of the model was absolutely smooth and although I have a preconceived lack of faith in one-piece tracks, I was surprised by their easy installation and by their “willingness” to accept the CA glue. Open engine covers seduced me to install the “guts” from the set by Extratech but the floor under the engine must be shortened a bit (about 2 mm) to make the whole set fit in the bay. Side skirts are scheduled for a kit by Revell/Matchbox but they can be used for this model as well, although I have a feeling that they are sitting rather too high (thank you Milan for this point!). Antennae were made from bristles from a wall painting brush, a stream of petrol from a transparent styrene rod stretched over a flame, a hose was made from a tin solder, commander’s headphones cables from a copper wire. The model was brush painted by Humbrol and Agama enamels, wash by oil paints Manes diluted in Zippo lighter fuel, weathering with pigments by MIG Productions. 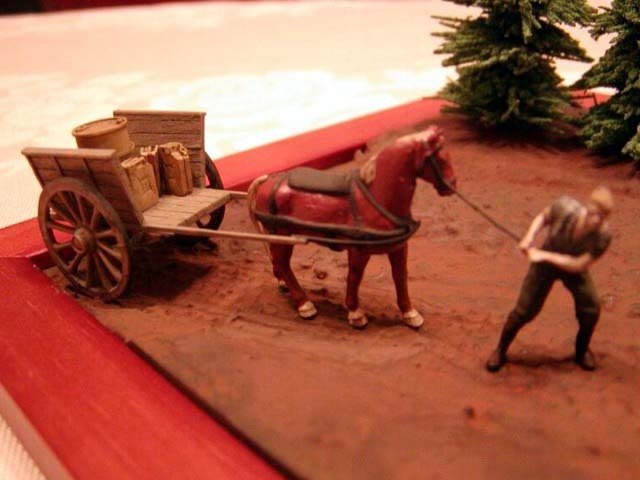 Figures were adapted from various sets by Preiser plus one artilleryman by Revell, a mule is by Airfix, a cart by Minimali Production, a barrel, funnel and jerry cans are from the „German fuel set“ by Attack.